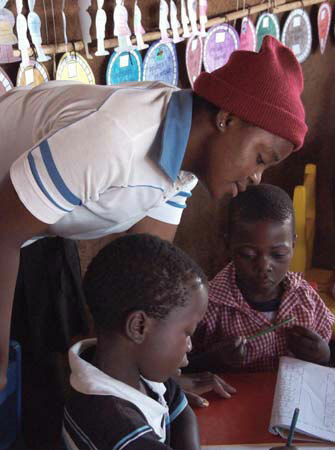 There is a huge shortage of qualified preschool teachers in Swaziland, yet there are few places where Swazis can study early childhood care and development in the country. In response, the Ministry of Education has organized a training course, which Matjana’s Teacher Ncobile Mbonane is attending. The training fee of 400 emalangeni (about US$60) is much cheaper than ECCD courses offered at private colleges in Swaziland. It also includes the cost of all meals and accommodation, meaning the participants can reside in Manzini while attending the course. “Without accommodation it just wouldn’t be possible for many women to attend. 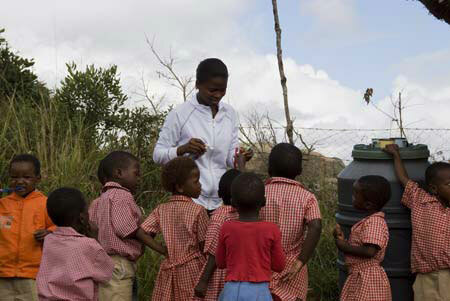 Most are from rural areas and travelling to town is difficult and expensive,” Hlophe said. Currently many communities are providing care points, where the children receive meals and play. “We want to support communities to extend care points to education centres, and training teachers is one of the greatest needs,” Hlophe added. In the meantime, Teacher Fortunate Sihlogonyane is holding the fort in Kaphunga. “Taking the class alone is a bit challenging, but it’s also fun. It is much easier when there’s two of us, so I’m glad Ncobile’s returning every second week,” Fortunate told us. “It’s also good to know that training is being provided as there are not many opportunities here in Swaziland. The training course will run again next year and I hope to be able to attend then,” she said. Ncobile will return alternate weeks when there is a break in training, to give Fortunate a break and to “make sure the kids don’t forget me,” she told us.